The Sumners: Life and Times: Trip to the A & E! Trip to the A & E! Today after school, Joshua took a fall at the park. He tripped and fell right onto a large stick, seriously splitting his chin. It definitely warranted a trip to the A&E (Accident and Emergency) at the Aberdeen Children's Hospital. 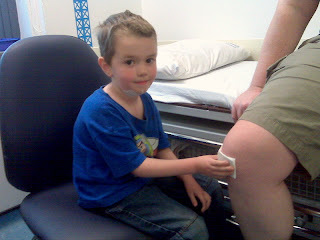 Joshua was very brave while the examined the cut and cleaned it out. Sorry, no pictures of the wound. It was the worst I have ever seen in person. They removed a small piece of bark, and decided that they needed to have a plastic surgeon take a look at it. There was a possibility that they would need to put him under anesthesia to further investigate for debris or muscle injury. We waited almost three hours for the surgeon to come, but he was very friendly. As the surgeon put on his gloves, he offered one to Joshua as well. That was a big hit. The surgeon was able to see that it was clean, with no damage beyond skin and fatty tissue.... nothing that some butterfly tape and glue couldn't fix. Darren joined us about two hours in to our wait. Joshua perked up as soon as he arrived. They played connect four and talked about Darren's many visits to the doctor as a kid. Joshua was also inspired to play doctor. He treated Darren's pretend knee wound using many of the same techniques that were used on him that day. Very fun to watch! What a brave, little boy! It was a very long wait at the A&E, over four hours. But we are so blessed in our community here to have friends who kept Abigail all evening, and even pulled in my laundry and folded it. Long day, but the kids are sound asleep and I am gonna sleep well tonight! Christy...so sorry to hear about Joshua's ordeal. How are you holding up? It is wonderful to hear that you are surrounded by a great community to help and I love the Buzz Light Year smile with Darren at the end of the post. Oh NO! I'm so sorry for your little guy and you! What a horrible evening. I'm so glad you got an official pronouncement so you didn't have to worry. I'll pray that his chin feels better quickly. Miss you dear. Joshua is such a trooper. Seriously.